Check out Tobi's Roman Emperor Metallic Bralette Body jewelry takes on a new dimension with the Silver Roman Emperor Metallic Bralette. Perfect peeking out from a denim jacket or a deep plunge party dress, the adjustable metallic bralette is constructed from silver tone chains in a classic triangle shape. Add low key sparkle to going out looks with this bralette. Body jewelry takes on a new dimension with the Silver Roman Emperor Metallic Bralette. 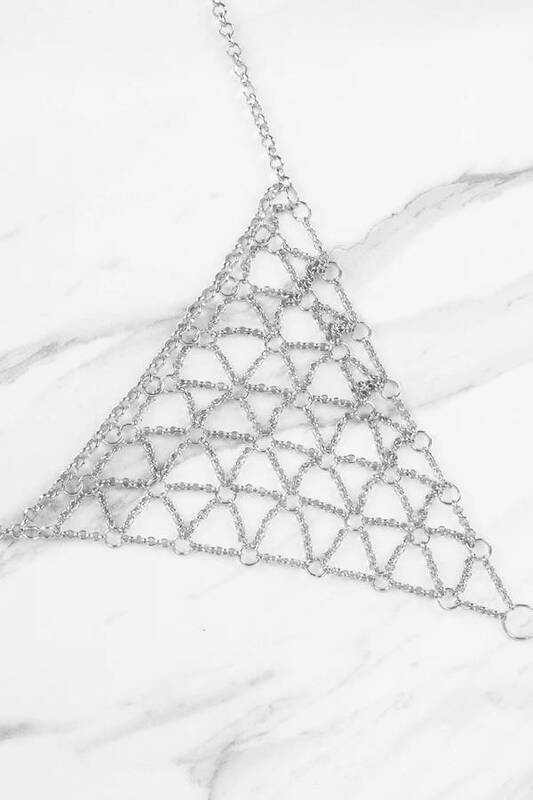 Perfect peeking out from a denim jacket or a deep plunge party dress, the adjustable metallic bralette is constructed from silver tone chains in a classic triangle shape. Add low key sparkle to going out looks with this bralette.